Limit dirty checking to the given scope when reacting to user events. 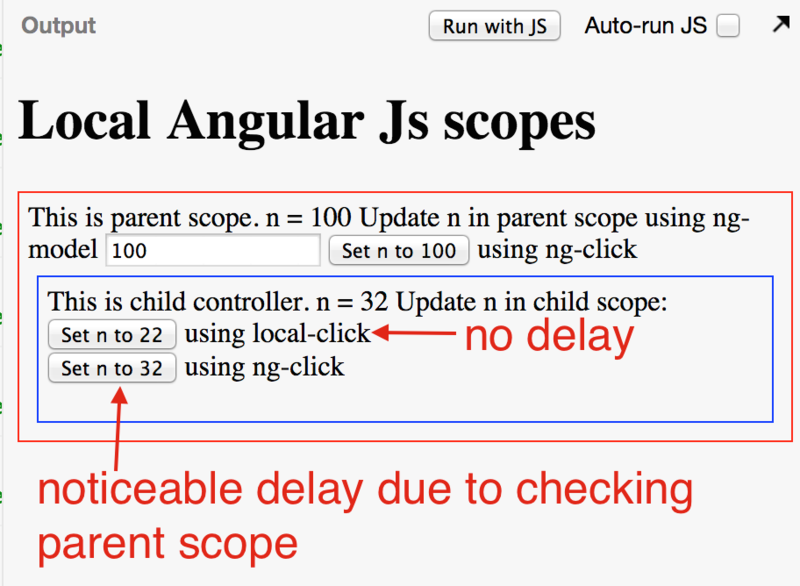 Main performance bottleneck in AngularJs is the digest cycle and its dirty checking. Each watch expression is checked against its previous value to see if something has changed, and if it has, the change needs to be propagated to the DOM. You can even see how long the digest cycle runs by itself by using a code snippet ng-apply-idle-timing.js. If an idle digest cycle takes longer than a few milliseconds, then you have a performance problem - too many expressions being evaluated, or they are too complex. One property of the digest cycle has caught my eye. We usually do not call scope.$digest directly. Instead we call scope.$apply, which parses expressions, guards against exceptions, and starts the digest loop. The apply method always starts the digest cycle on the root scope, see source code. If we modify a property on a leaf scope, we still check through every scope, starting with the root. This seems very inefficient, yet every built-in Angular event handler kicks off the $apply() method, see ngEventDirectives. To avoid unnecessary work, I wrote a local scopes demo where I implemented 2 changes. 2: I copied ng-click to new directive local-click that calls scope.$localApply instead of scope.$apply. Other built-in directives could be cloned and modified the same way. The jsbin demo shows the result with 2 scopes: one inside the other. The parent scope is outlined in red, the child scope is outlined in blue. Child scope has very simple watch expression without a delay, the value n is bound to the HTML using template expression. There are two buttons in the child scope, both changing value of n. The first button is using the local-click directive shown above, that only dirty checks the current scope (and its children). When you click the first button, there is no delay, the value in the DOM updates immediately. The second button uses built-in ng-click button that kicks of dirty checking from the root scope, leading to the long watch expression evaluation inside the parent scope, even if it cannot be affected by the change in the child scope in this case. This is just a small test, and replacing every built-in AngularJS event directive with local- equivalent would not work. For example, services like $timeout and $q are tied to the root scope and need to kick off the full digest cycle. But in some cases, the data changes are isolated to one controller and might not need the expensive apply call. The developer should decide where this is appropriate, similar to making the decision when to use one-way instead of the two-way data binding.